Victimhood is never socially neutral. It involves powerful interests, diverse inequalities, and media representations that tend to privilege particular understandings of victims. This excellent text provides a critical interrogation of victimology by emphasising context and interpretation, politics and social justice. It, too, is not socially neutral, and we are all the better for it. The first edition of the book came out in 2007. The publication of this second edition within ten years is timely and likely to be viewed positively by lawyers, students of law and criminology, policy-makers and players in the law and justice sector such as judicial officers, prosecutors, and prison administrators and by scholars of the sociology of crime. This is an excellent introduction to the study of victims and victimisation. An accessible text that will be of great use to undergraduate students. A welcome addition to an area which is largely ignored by the criminal justice system and society as a whole - victims of crime. This book is well written and is a must for students who are studying a policing or criminology course at University. 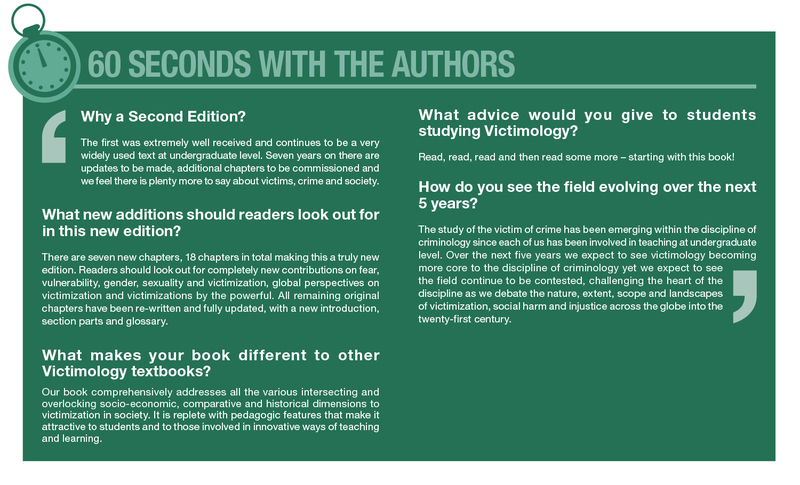 This book is essential for students who are currently studying victimology. There are many activities which can be used. This is an easy read and covers a wide range of areas around victims. An excellent book which will be recommended to out library.